Many of you know that, when I finish a long knitting project, I do not want to see a set of needles for a couple of days. So of course I lost my knitting mojo for a while after finishing my last project. But it seems that I've found it again. It allowed me to make some progress on Charlie. I just plopped myself on the couch and watched some good T.V. shows and movies to knit to. Before I knew it, I had an almost completed front. 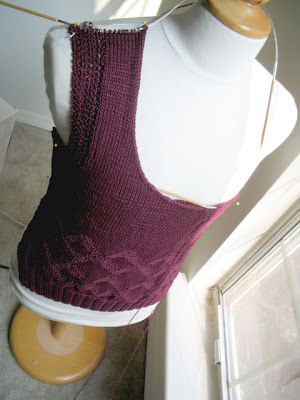 I was going to make it a deep scoop neck, but I think that I MAY want to make it a cowl neck. I'll figure out what I want to do by the time I finish the body.